I have a few Anderson & Sheppard DB suits, but no jackets. I have found that the jacket of my royal-blue flannel suit, however, works well on its own, and that led to this commission last year for a lightweight DB jacket in a brown Loro Piana cashmere. To work on its own, of course, a jacket must distinguish itself from a regular suit in either pattern or cloth. This does both, with the large Prince of Wales check and spongier finish of cashmere setting it apart from a hard-finished worsted in plain navy or grey. Anderson & Sheppard DBs work well, I think, because their large and drapey look needs some style injected from somewhere else – whether that be in the cloth or in design details such as the double breast. A friend of mine has a single-breasted A&S suit black mohair with peak lapels, which works for the same reason. The old phrase is that A&S suits were for me who had their own style, and didn’t need any from their suit; I prefer to add something to them myself. If you are slim, as I am, the drape-cut DB also creates a particularly complimentary effect in the chest. Both the sweeping lapels of the DB and the extra draped cloth create an impression of bulk, and together the effect is exaggerated. Last week, in the first of these posts, I said there was little point in a direct comparison between the four jackets. But I’m intrigued nonetheless, as to which is everyone’s favourite. So tell me, which do you like best, and why? You can follow the discussion on Anderson & Sheppard DB jacket by entering your email address in the box below. You will then receive an email every time a new comment is added. These will also contain a link to a page where you can stop the alerts, and remove all of your related data from the site. Although all jackets are timeless and elegant, I think the Solito jacket is most worthy of envy.It looks understated with charcoal flannels yet is colourful and (I’m guessing) may be worn far more casually,too. It has to be the A&S DB suit, not because of the make of the cloth (though i am sure this will have some sway) but for the sheer style. DB is not common, the colour wave is excellent, the cut looks excellent, its more traditional which is how it should be. Overall a winner for me. The least favourite is the blue/white check. It may be the material but, it does not look right to me. This is timely as i was going to ask for some advice on colours for a jacket that goes with eveything (if that exists!) and that would be suitable for a more summer casual look. I was thinking of a blue/white check but when i saw the materials on offer i was not sold which now pleases me having seen yours. Sorry but i dont like that look. You always mention brown as being a good colour but if so, in what shade and more importantly in what material. Would you suggest a plain heavy linen in brown and if so, what make? It seems that everytime i have a jacket made i end up not being able to match it with trousers and have come to the conclusion that plain materials are easier to deal with but, one cant have everything plain – can they! Some good, common sense advice based on your experience would be most appreciated. Keep the posts coming in, they are enthralling. Mind you i dont know how you manage to accomodate all these new clothes – oh i am just envious trust me! As you asked for feedback, I will dare to be the first to express my humble oppinion. All jackets are beautiful and I wish, I only had one of them. Nevertheless, the Liverano & Liverano jacket seems to stand out because of its unique color and style. Despite the unusual color the jacket remains elegant, simply beautiful. It is an incredible balance act if one could say so. I like the A&S and Solito, best, the cloth and cut of both being more to my taste. The pictures of the Liverano don’t really show the cut or fit, particularly at the quarters. I don’t like the cloth on the Vergallo. I may be biased as I’ve admired the work of both Solito and A&S from afar for a while now. To start, thank you for the series. It’s been really nice to see these jackets back-to-back for comparison. There are lots of great details to consider and appreciate. Your question is a tough one to answer because they all look well done and have interesting fabrics/textures. I really love the color of the Liverano jacket and the shoulder/chest cut works well on your frame. The lapel detail on the Vergallo gives it additional versatility and the suede collar is cool. The jacket drapes well too. I like the Solito because of the Neapolitan cut and it just looks comfortable – just like a great sweater. The Caccioppoli fabric looks like an inspired choice. Finally, the A&S has a lot of visual interest, drapes really well, and it’s hard to go wrong w/Loro Piana cashmere. However, if I had to choose one I would pick the Vergallo – by a touch over the Solito jacket. 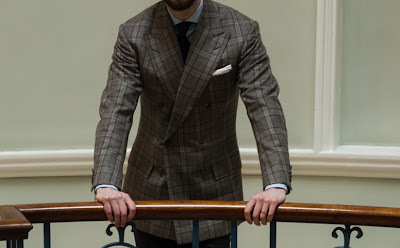 The Vergallo’s versatility, extra details, and nice pattern make the jacket unique. But the Solito is great kit too. Hmmm. Both your Liverano and A&S are very impressive. Vergallo and Solito have the best fit and look the most comfortable; it’s hard to comment on the Liverano because we don’t get to see the whole thing. I’m not crazy about the lapels of the A&S. Thank you for the series! Opinion based on the pictures but likely to change once seen personally. The Solito is particularly impressive, understated and very Neapolitan- it looks incredibly comfortable. The Vergallo is probably the most practical. I can’t quite make up my mind on the Liverano; the colour is fantastic but am unsure of the cut particularly around the chest. Whilst the Loro Piana cashmere is beautiful, I have never been fond of DB blazers. Solito, hands down, although a better pic of the Liverano would have been helpful. For me it has to be the Solito – it is both stylish and contemporary looking, and looks as though it can be dressed up or down effectively. The colour and check are just beautiful, original and different from all the other jackets you see but without being show-offish, gaudy or overly flamboyant. This series has been a pleasure to read. On the topic of jackets, I recently purchased a DB 6×2 blue herringbone linen jacket, quater-lined and unstructured, with real pearl buttons (although I may change that as I’m unsure of them), just in time for summer. In terms of what to wear on the bottom, would cream or white shorts be appropriate, or is a jacket and shorts a bit of a statement? Otherwise, what would be some trouser suggestions? Thank you. Hi Simon – a question, when you talk about the “drape” of the chest in the A&S what does that actually mean? I’ve heard lots of people refer to this particular point without ever understanding exactly to what it refers. The vergallo looks like an old friend, the solito is very relaxed, the liverano is too much daytime tv presenter for me, the A and S just trying a bit too hard. All look great and I would pounce if any of them turned up in my local Oxfam. Anderson and Sheppard without a shadow of a doubt. By far the most debonair, elegant and best for a mans figure! The other jackets are fun pieces to wear now and again, but if you really want to look good you know which one to go for. It is bloody smart. Liverano and A/S are the most interesting to me both because of the cut and the fabric. I find the solito and vergallo cuts don’t really stand up to the fabric you used. Love him or hate him, this is what Tom Ford’s design team does really well: Pair the textures and patterns of the fabric with the cut of the jacket. May I ask which LP bunch the A/S jacket was from? I love the bold take on the PoW and that type of PoW check is very hard to find in the books my local tailors keep in stock. Solito by a wide margin, followed by A&S. The cloth you chose for the Solito jacket is lovely – the green is very elegant and somewhat uncommon, without being over the top. In my eyes, the cut also suits your frame better than the others. For what it’s worth, I also think it’s nicer than the Caliendo jacket you have written about before. The gorge on the Solito seems a bit higher, and the shoulder looks a bit cleaner (more subdued grinze), both of which I prefer. The cut of the A&S is nice, but for me a DB jacket in the large checked cloth you selected makes it look like you’re trying a bit too hard. I am not a fan of the Vergallo or the Liverano. The Vergallo doesn’t have much shape and I don’t like the large, high contrast houndstooth. Also the grey suede details don’t add much in the way of interest for me. I’m not crazy about the roll of the lapels on the Liverano. It seems that the third button is too high, and therefore the lapels only begin to roll slightly below your pectoral muscles. That, combined with the strong shoulder, make the jacket look somewhat boxy to me. In the spirit of full disclosure, I am very partial to the Neapolitan style and have my suits and jackets done there. Great series although I would love a more specific list of costs for my own comparison. All of the pieces are beautiful so I am going to cheat a bit and say the Liverano and the Solito tie for best. Both the Liverano and the Solito have intriguing fabric colors, which are striking and bold yet not in an obnoxious way. Next would be the A&S, which would have been part of a three way tie for first if the A&S had been single breasted as I am not crazy about the double breasted as a stand alone jacket opposed to a part of a suit. 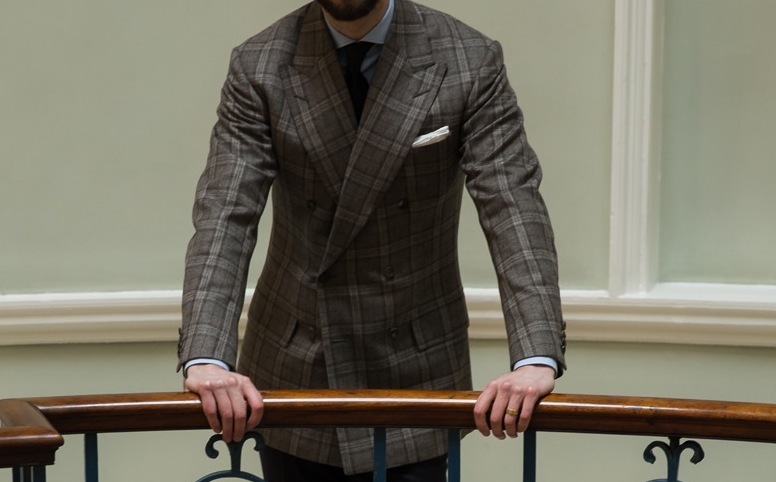 Lastly, albeit in a very tough field, there is the Vergallo which has the simple houndstooth and seems to get lost in the mix with the aforementioned very special colors and fabrics. Hands down, the A & S jacket! The cut, the check design makes it for me, the favorite. I feel that two of the jackets stand out for me. The Liverano & Liverano jacket is stunning due to its color; it is not a cheap “look at me” jacket but a well made attention piece. The A&S Double Breasted Jacket stands out due to its cut and pattern. In the end, I would actually wear the A&S because I would feel too self conscious in the Liverano (my failing, not the jacket’s). I must disagree with the idea that the A&S blazer is for someone who ‘trying too hard’. I don’t even think that is possible! I love the Solito and the A&S, but if I saw you on the street with the Liverano, I would stop you to tell you directly how beautiful the jacket is! It’s a good point – and some bespoke cutters have worked with RTW pattern makers, or indeed done so on their own RTW lines. However, it’s not all one-way traffic. 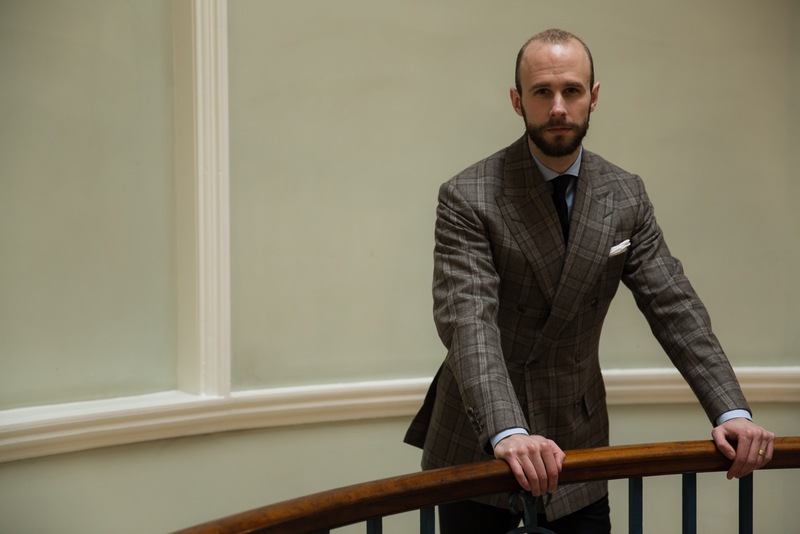 The best RTW companies do things in cut and cloth that are more attractive than many tailors – if you removed the bespoke fit, they would be more stylish. Some Ralph Lauren, Paul Stuart and Tom Ford falls under that category for me. How do the jackets compare in terms of comfort? Btw, all four look beautiful, though I’m especially partial to the fitted shoulders on the Liverano, and the relaxed elegance of the Solito. A&S clinches it for me. Simple, subdued elegance. Lovely jacket Simon, best DB of yours i’ve seen. What weight is this cloth? Any idea why the Prince of Wales no longer looks as dapper as he used to look in the 1980-90s…is it because his cutters at A&S have changed and Colin Harvey no longer cuts his suits…and the new cutters don’t have the same old style? Or has he gone to T&A? If this is the case, do we have similar issues at other houses too…ie people change and the traditional house cut changes/deteriorates over time? A very striking jacket Simon. I have always loved the Anderson Sheppard DB look, and even though I have several bespoke suits and am beginning another commission next week from another well known London tailors, (addicted, yes) I have so far not gotten around to buying a an A&S DB suit. The reason why? At this stage in my life, I cannot afford/justify the circa £4k price within my disposable income. So, that being said…. Here is a question which some may find distasteful (I can be a coward in the anonymity of the internet) is it common for tailors to work…. outside hours, in the comfort of their own home shall we say? Same tailor, same training, same house cut, but made off premises in their own time and potentially with the customer even sourcing their own cloth… Service provision only. And therefore costs greatly reduced. The same as your friend in the pub who is the British Gas employed boiler engineer, who will fix your boiler in his own time for a much reduced price, off the record of course. Obviously this is not as crass as walking into A&S and asking the nearest cutter “do you work on the side?”, but more a case of trying to find that “friend of a friend” who acts as an introductory. I know this will offend some no doubt, but I am just wondering if this is achievable (if that’s the right word). Of course, there are those tailors who are “ex-Anderson Sheppard” (or other Savile Row house) but my research so far has shown that largely these tailors either move to another house, or set up similarly ‘branded’ houses/consultations in nice London showrooms where we are almost back to the original price. What’s so beautiful about the A&S house is the unique drape cut, so it’s not as simple as to say “Just get another tailor to copy it from a picture” sadly. Then of course, some will say “Just keep saving”… Fair comment, but the price of SR seems to go up by about 10% each year. Having had several suits made, as much as I love the process, I am not so bothered about experiencing the ‘S.R. experience’ + S.R. rent which justifiably adds a lot of cost to the actual suit, I’m just a suit lover who would love an A&S house style DB suit. Yes, I can see the paradox of this. The house has to retain its unique look within its own doors, for obvious reasons. And to be fair, I do understand their position. Paradoxically, I also am sympathetic to the tailor who might want to make some extra cash on the side. Pretty grey area in my opinion as to the morality of who owns your skillset. Anyway, at least I now have a starting point to try and research said tailors! I’m happy being measured next to a kitchen sink in someone’s flat if need be, none of the trappings of coffee and conversation mean much to me. Am also educated enough to source my own cloth by now. I have this psychological block where I can justify spending 2-2.5K but not 4k. Love your site by the way, have been a long time reader for several years now, great work, not too slavish to tradition where it becomes a costume drama like others can, which is what I like about your stance on clothes. Also, not too fussy which I see a lot of menswear proponents are starting to become as some sort of way to display their knowledge of clothing. Thanks J, nice to know that comes across. It’s interesting on the fussiness point. The longer you do this, the more you retain the information you need and find useful, and the less patience you have with extreme technical detail. It’s easy to miss the wood for the trees otherwise. It’s like anything, when you are in that initial stage of passion for your new hobby, most of guys (yes, a male tendency I think) tend to want to boast about, show it off and ‘prove’ ourselves to those similarly interested in the topic. I am at the stage where I just like clothes to be very high quality materials (which I expect for the price I pay) and made well. If there’s a nice heritage British / Italian backstory then that’s also nice. I like to be dressed in a way where someone would feel comfortable saying “you look smart!” – I do not like this menswear drive online which seems to be about ostentatious accessories, excessive details on things perhaps to show it is bespoke or such and such luxury brand. To my mind, all that does to the outside viewer is create intimidation or bewilderment so the opposite now occurs…. Your ‘audience’ would not feel comfortable approaching you and striking up a conversation: “Nice jacket, where did you get it?” because you look like you are taking yourself way too seriously. I’m more of the Hardy Amies school – “A man should forget about his outfit as soon as he has walked out the door”. Thanks for this informative post. I’m hoping you can opine a bit on how an A&S suit might fit into a wardrobe with a Neapolitan suit. Essentially, is there versatility to be had from a wardrobe with both a bespoke Neapolitan suit and an A&S suit, or are their styles diametrically opposed enough that it doesn’t work? I have one suit from a Neapolitan tailor that I’m happy with, and it’s time to have another commissioned. I like the soft shoulder and its comfort. It also looks great. I will certainly go back to Naples for more suits. A&S is the one Savile Row tailor that seems less “stiff,” if you will, given their softer cut. I was hoping you could briefly opine on how soft the shoulder is compared to Neapolitan tailors? I’d like to get a sense of where A&S falls on the spectrum between some of the “stiffer” cuts of the Savile Row tailors and Naples. A&S is in distinct contrast to both Neapolitan and stiffer English cuts, as it has structure that is more similar to the English weight, but achieves softness through the drape. I would say it could easily fit into your current wardrobe, perhaps as a slightly more formal jacket – whatever the material. Certainly I would go for that before other English makers, given your tendency towards Neapolitan. Very interesting. I’m always looking for jackets to wear more casually. I love the Liverano – strong and unusual colour. I’m considering a sports jacket made at A&S. Never had a bespoke before so first foray into this. What kind of cost for a tweed or Shetland wool? I know it varies but on average? I have 4 Drakes belvest sports coats and love the fit, is A&S house style going to be too structured? Just think it’s an item I should own given the heritage of A&S.